Thank you to everyone on one of our online photography courses who took the time to enter January’s tutor project, which challenged us to go against convention and photograph against the light. This is a difficult and challenging process in terms of controlling exposure, but we are extremely impressed by the high standard of entries this month, especially with he creativity used to explore the contre-jour style in a whole host of settings. The images you captured used the high contrast lighting conditions to draw attention to shapes in nature, the built environment and portraiture and we hope this is a style of photography you will continue to explore. The combination of light and dark to such extremes not only emboldens the physical presence of the subject but also imbues the image with mood and expression. These are qualities that touch the viewer in some way and elicit an emotional response. It’s making that connection with the viewer on an emotional level that is the key to successful photography. Ian’s depiction of Mary’s Shell on Cleveleys Beach just a few miles north of Blackpool is a beautiful looking photograph. Ian uses the technique of shooting into the sun to capture the elegant design of the shell and its effect on the surrounding beach, where the spiral shape in its design casts a series of radiating shadows in the foreground. Ian uses the low-lying sun’s effect on the sculpture as a way to extend the object’s shape and form through shadow. He uses the light to present the three-dimensional sculpture in a way that shows the artwork interacting and merging with its environment and therefore strengthening its physical presence. The way the shadows radiate out towards the camera creates a series of leading lines that draw the eye from foreground to the point of interest. Notice how each shadow radiates from the sculpture to the sides and centre of the framing. This effect is helped by the wide-angle focal length that ensures the foreground has an impact. The arrangement is both elegant and dynamic, where the leading lines create movement in what is essentially a static scene. The shadows also give the foreground area interest. 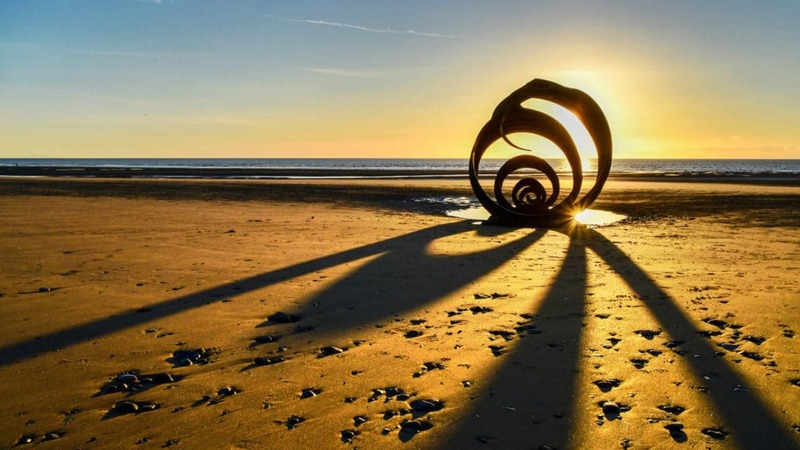 So, the enjoyment of this presentation doesn’t just lie on and around the silhouette of the shell sculpture, but through the shadows and the way the sunlight reveals the textures and shapes of the beach too. The bold and dramatic lighting conveys warmth with the orange-yellow hues developing the aesthetic impact of the beach — the vibrant colours complementing the silhouette and shadow. Ian shows good control of the depth of field to bring the foreground into focus, with clarity continuing up to and beyond the sculpture. What also impresses is Ian’s control of the intense sunlight. The image looks directly into the low-lying sun, but the highlights are not blown. The graduation of colour from bright to dark is well-managed. This is an image that works in either colour or mono. However, the rich golds in the way the sand is lit give the image a strong colour emphasis that complements the bold shapes and patterns created by the sculpture and shadows. Well done, Ian. Cracking shot! Jack’s use of contre-jour stood out to us when evaluating all of the different entries. This image is a great example of being in the right place at the right time with the camera. 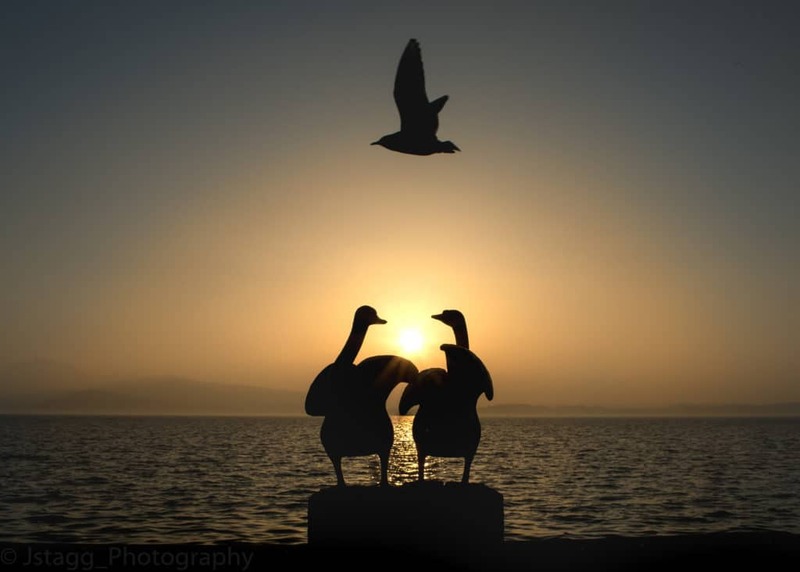 Taken at Lake Zug in Central Switzerland, the alignment of the two swans sitting on the wall against the sun throws them in silhouette. This reveals their shape in a way that intrigues and catches our attention. There’s expression in the way they appear – a sense of the two birds interacting in some way and the sun in the centre brings this sentiment into sharp relief. The cherry on the cake in terms of composition is capturing this moment as a gull flies overhead, perfectly aligned with the two swans. This creates a robust triangular shape that connects and contains our three subjects elegantly and distinctively. What impresses us also is Jack’s control of the exposure in such a fluid moment, stopping down the aperture to temper the sun’s strength so that the highlights are not blowing out colour and detail in the sky. This is down to Jack’s planning and perseverance at the time spent at this location, watching, waiting for the moment to arrive and having the camera set-up to deal with the light effectively. So, behind that spontaneous quality in the picture are hours of patience and preparation. A one-off shot and a great example of how serendipity can play such a huge role in a photograph’s impact. Photographing against the sun produces some bold and dramatic shapes in anything that stands between the camera and the light. We can see that result to great effect in the range of entries to the project as a whole including Ian’s and Jack’s images above. What we also saw was the use of that high contrast lighting to produce something altogether more gentle, subtle and atmospheric. Suzy’s depiction of the morning mist on the river in Alresford, Hampshire captures the ethereal quality we have all experienced as the sun rises on a still morning. The mist diffuses the light and casts a warm glow over the river and surrounding area. Suzy’s use of the backlit trees and hedges as a powerful framing device beautifully presents the golden light we through the centre. 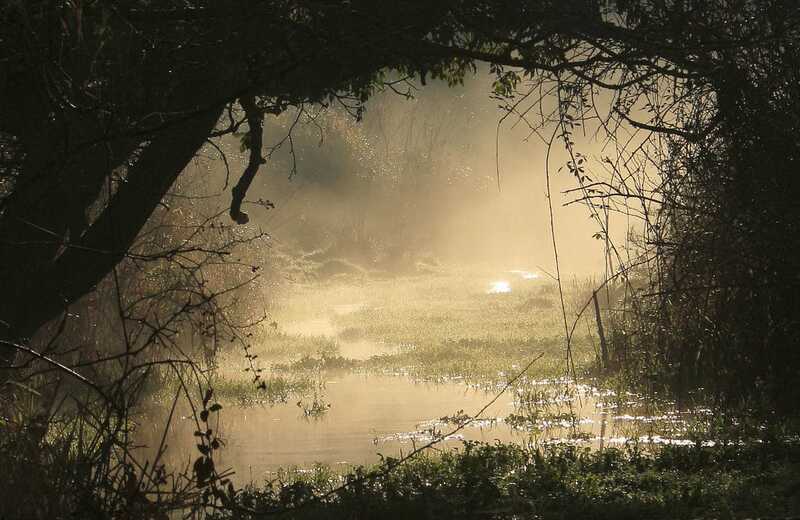 The image is not dominated by one or two key focal points but has a unifying theme of peace and tranquillity conveyed by the way the warm light passes through the mist and softens the definition of the river. The effect of the natural framing created by the silhouette heightens the sense of this being a haven, a place set apart from the hustle-bustle of the emerging day and in this way, the image touches us on an emotional level. Exposure control is good, with just a little clipping on the patches of highlights where the light’s intensity is greatest. A little highlight correction removes this and also adds a little more contrast to the lit area, revealing detail in the grasses and foliage. Antoinette captures the joy and happiness of her son as he receives some good news about a forthcoming trip to Australia. There’s a lot of energy and expression in the subject as they are captured mid-air. The lighting effect throws the subject into silhouette, and this pronounces the athletic shape of the body as it jumps, heightening a sense of movement and energy. What the backlighting effect also does is allow the subject to stand for something we can all recognise. 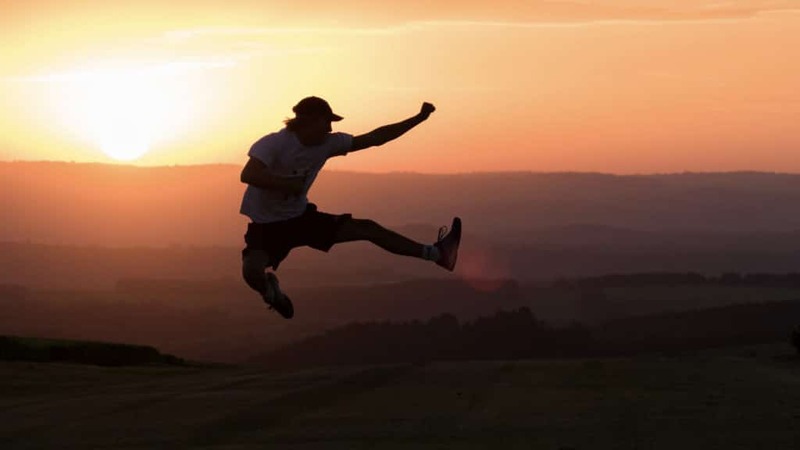 The emphasis is less on the individual because we cannot see their face or expression, and more about what their body movement expresses – a sense of freedom, spontaneity, embracing life with the beautiful, wide-open visa behind underpinning these ideas. And those are qualities and sentiments that will touch the viewer regardless of whether they know this subject or not. That’s why the image resonates so positively. What also works is the softness in the lighting and the transition of colours from dark to pale orange and yellow. We can see the effect of the sun on the landscape through the layers of mist or haze and that also conjures up a strong sense of the warmth from the low-lying sun. Antionette’s control of the strong backlighting is effective with highlights kept in check. There’s some evidence of lens flare, but the specular marks do not upstage other parts of the picture and serve to heighten the visceral effect of the low-lying sun at the time, giving the image authenticity and spontaneity that play into the expression of the subject as they celebrate good news. Congratulations to all entrants for an exceptionally high standard and remember, next month will be officially deemed a competition with prizes for the winners. Find out about IOP online photography courses. ‹ What Is EXIF Data?